This leads me to my new update: I have decided to begin the process of turning “Songs of the Victorians” into a 19th century sound studies journal. If any of my readers are interested in submitting content to be considered, please contact me (jes8zv@virginia.edu). Our panel had an enthusiastic and invigorating question and answer period in spite of the hour (the panel began at 8:30am), rounding out our session. Overall, it was an excellent experience, and I’m grateful for all the feedback we received and for the interest in nineteenth-century musico-literary studies. On Friday and Saturday, I attended THATCampVA held here at the Scholars’ Lab in Charlottesville, VA. It was a wonderful experience! In case anyone is unfamiliar with the idea of THATCamp, it’s an “unconference,” where people who share an interest in digital humanities come together to share ideas and projects in an informal setting. Rather than conventional conferences, where people read papers and attend pre-scheduled panels, at an unconference, people pitch panel ideas both online in the days before the event and in person, and the panels are then scheduled on the spot. The panels often have someone leading the discussion or demonstrating a tool, but the majority of the time focuses on everyone sharing their ideas: essentially, everyone is a panelist. I attended a very informative session on digital pedagogy on Saturday morning in which we discussed such tools as NowComment, class wikis, class-wide digital projects, and helping undergraduates cultivate their digital presence. At another great session, we learned to make twitterbots, and I created my own based on one designed by Wayne Graham. During lunch, we all heard some #dorkshorts, in which attendees have three minutes to demonstrate a digital project. We heard fascinating presentations on the new design and features of the Collective Biographies of Women project and QLTP, a project that helps people create editions of Latin texts. I also presented on “Augmented Notes” and “Songs of the Victorians” during this time, and got some great feedback. In the afternoon I attended a really interesting panel on tools to analyze audio. THATCampVA was wonderful, and I’m glad I was able to participate. In other digital news, the code for “Augmented Notes” is now up on GitHub. If you want to look at how it works and to play with it, you can fork it and make any changes you want! Also, I added a new feature: on the “Box Drawing” page, users can now click on the “Align Boxes” to make all boxes the same height. This should help produce a cleaner archive page for those who wish their boxes to be uniform. Please try it out, and let me know what you think! I’d love to hear your feedback! On Friday, I had the honor of giving a talk, called “From the Parlor to the Laptop: Victorian Lyrics and Digital Tools,” at Columbia University about Songs of the Victorians and Augmented Notes. Alex Gil, the Digital Scholarship Coordinator there and fellow Praxis Program alum, invited me as part of Studio@Butler’s digital humanities speaker series. I really enjoyed the format of the afternoon: first, I delivered my talk and we had a question and answer session, and then, after a short break, we reconvened for a workshop in which I walked the participants through making their own website with Augmented Notes. 1. Users upload three things to make an archive page: ogg and mp3 audio files (an ogg is necessary because firefox can’t play mp3 files) and pages of the score. Users can optionally upload an MEI file. 2. 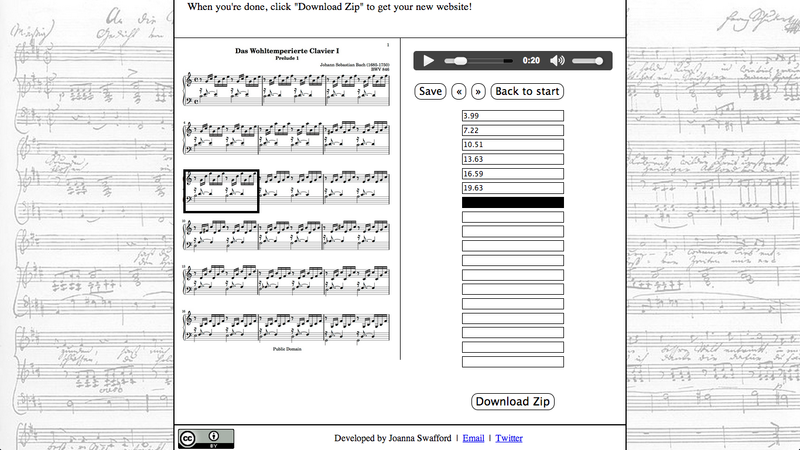 The site then takes users to a page where they click and drag to draw boxes around each measures (they can also edit the sizes and order of these boxes); these boxes are what highlights each measure in time with the music. Box Drawing Page: Boxes are red as they are being drawn (through clicking and dragging) and grey once they have been created. Users can edit the boxes by changing their size and order and also delete them. 3. The site then takes users to a page to set the time data: they hit the “save” button at the exact second each measure ends to record that time. The site brings together the measure and time information, which enables each measure of the song to be highlighted in time with the music. 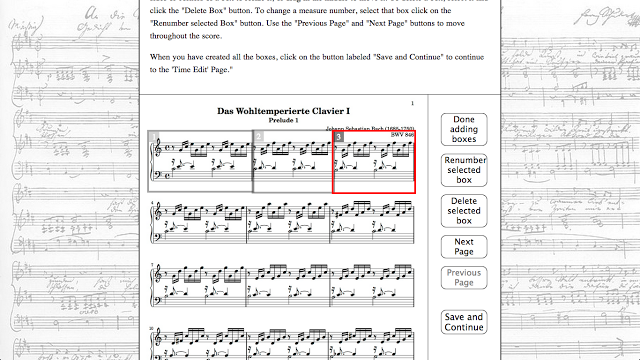 Time Edit: Users click on the “save” button at the exact end of every measure, which records that time in the open boxes at the right. I was very grateful for all the fascinating suggestions and feedback I received in the question and answer period. Some people suggested that I should consider altering the box-drawing tool to let users draw any shape they want: this would let users circle individual notes and entire phrases. At some point, I would love to add this functionality, although I will not have time to build it until next fall, because I am currently teaching, finishing my dissertation, and going on the job market. 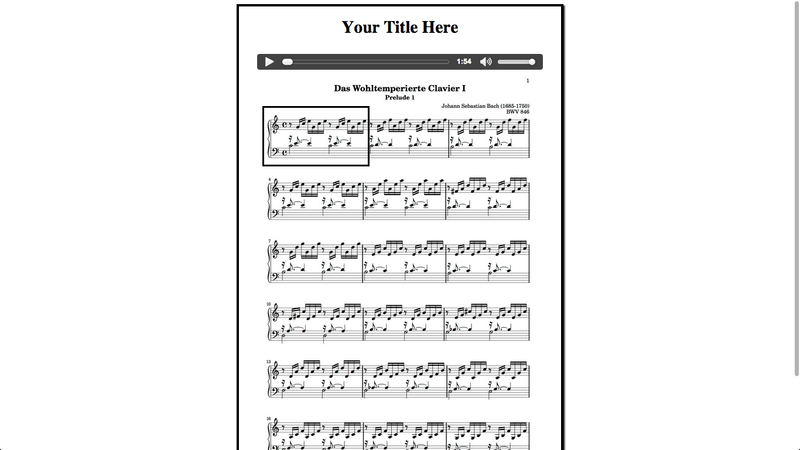 I was also pleased to hear that some people are planning to use my tool for the classroom, especially in music appreciation or introductory music classes to help beginning music students follow along. If you have any comments on the new features in Augmented Notes or ideas for future features, please do let me know! I’d love to hear your feedback! On Saturday, I was one of a number of coaches for Rails Girls at the Roy Rosenzweig Center for History and New Media at George Mason University in Fairfax, Va. This wonderful event is designed to help teach women the basics of Ruby and Ruby on Rails, and to ultimately help them build an application. It was an excellent experience: I was so impressed with how quickly all the attendees picked up the basics of the command line, programming, and web development. For those of you who would like to see exactly what we covered, we first went through much of Ruby in 100 Minutes and then jumped right in with building a Ruby on Rails address book application that lets users input their name, twitter info, picture, bio, and address, and then plots the address on a map. Students who wanted a further challenge then followed instructions to put their app online using Heroku. For example, Elizabeth Hopwood, one of the attendees I worked with, put her excellent app online and populated it with “Downtown Abbey” characters. I’m so grateful to Jeri Wieringa and Celeste Sharpe for organizing this event. I’m thrilled to have been part of something that helps teach women how to code and that can actually help change the programming culture: on numerous occasions at conferences, I’ve had people insist that I couldn’t have created my two digital projects and that, as a woman, I must be taking credit for the programming work of a man. Programs like Rails Girls can help change those horrible perceptions, by helping women feel welcomed into coding and into a supportive programming community and by publicly claiming programming spaces for women. I look forward to hearing of future Rails Girls events, and I hope to volunteer as a coach for other similar nearby programs in the future.